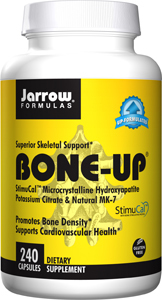 Bone-Up® is always UP-FORMULATED® to include the latest breakthroughs in bone health. HEALTH CLAIM: Adequate calcium and vitamin D as part of a healthful diet, along with physical activity, may reduce the risk of osteoporosis later in life. For best results, use with Jarrow FORMULAS® JarroSil®, the biologically Activated Silicon®. 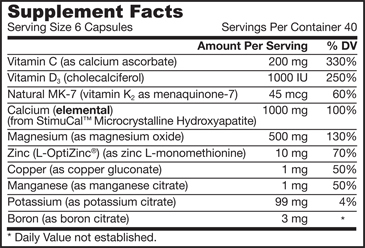 DOSAGE: Take 3 capsules twice per day with meals, preferably dividing the number of capsules equally with each meal (for a total of 6) to facilitate maximum absorption or as directed by your qualified health care consultant.